Creating a combination of strengths that make it an ideal destination for global and local events. We have a central London conference team who handle all London event enquiries and bookings. This gives you access to all our venues through a highly experienced and dedicated London event booking expert. To find out more call us or email us. De Vere Grand Connaught Rooms, 61-65 Great Queen Street, WC2B – With its unrivalled central London location in Covent Gardens, the Grand Connaught Rooms is one of London’s most impressive, stylish, and opulent event venues with space for up to 1,000 guests. De Vere West One, Oxford Circus, London W1B - Located in the heart of the West End, West One occupies 5 bright airy dedicated floors of flexible meeting space. De Vere Holborn Bars, Holborn, London EC1N – Step through the grand archways, built nearly 150 years ago, and you’ll find yourself in a truly inspirational venue with over 40 impressive event spaces. 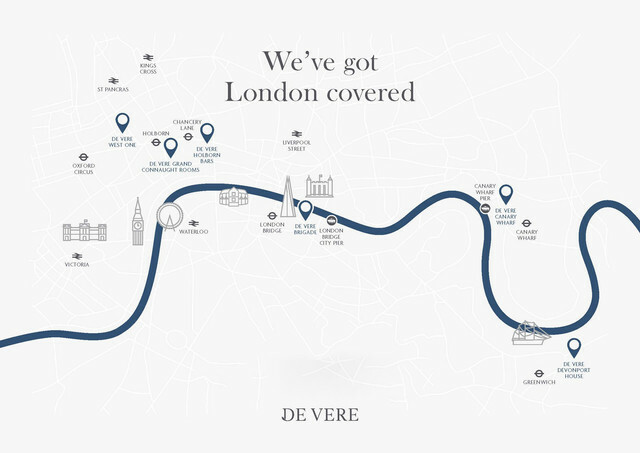 De Vere Devonport House, King William Walk, Greenwich, SE10 – Situated on a World Heritage Site, steeped in naval history and just minutes from the Cutty Sark, this hotel offers 13 state-of-the-art meetings rooms and is just 20 minutes into central London.